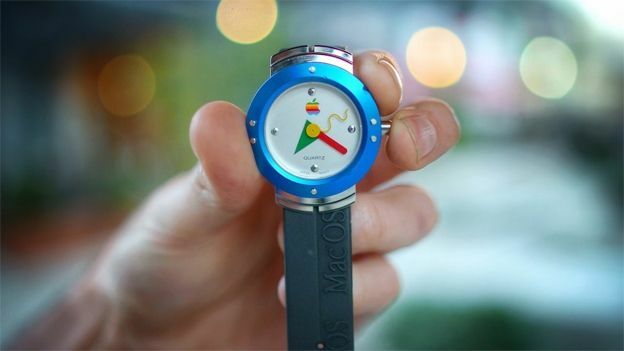 It turns out, Apple has already made a watch. It wasn't particularly smart though. It doesn't work with any other devices or operating systems, it had no Bluetooth, no WiFi, and certainly no touch screen. It was at least made of anodised aluminium though, and it has 'Mac OS' embossed across the rubber band, so there's that. You see, the original Apple Watch was actually a free gift designed to entice people into upgrading to Macintosh System 7.5 back in 1995. If you did upgrade, you could choose between the Apple Watch, or Conflict Catcher 3 - a forgettable bit of system management software. What we're essentially telling you is that it's a fairly worthless bit of tat, or at least, it was at the time. Now of course, it's a genuine watch with an Apple logo on it, and apparently that makes it worth something, with a few entrepreneurial types selling them for around £65-£85 a pop. The watch emerged on the puntastic YouTube channel 'TechFast, Lunch & Dinner', where they showed it off to a few friends. One reviewer aptly remarks that "it's just a watch", while another takes a look and says, "you can tell that the [Apple] design language permeates through the whole ecosystem." Some people just love that Apple logo.